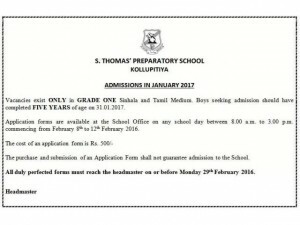 St Thomas’ Preparatory School invites applications for Grade 1 Sinhala and Tamil Medium. Boys seeking admission should have completed Five years of age on 31.01.2017. Application forms are available at the school office on any school day between 8.00am to 3.00pm. Commencing from February 8th to 12th February 2016.
cost of an application form is Rs. 500/-. the purchases and submission of an application form shall not guarantee admission to the school. Application closing date 29th February 2016.
for more detail see below image or visit St Thomas’ Preparatory School.